GHOST OF is a mourning song, not an exorcism or un-haunting of that which haunts, but attuned attention, unidirectional reaching across time, space, and distance to reach loved ones, ancestors, and strangers. Nguyen wrestles with what remains: memory, physical voids, and her family captured around an empty space. “There is nothing that is not music” for this poet. Poetry is found in the gaps, silences and ruptures of history. Sometimes it is as if these poems address the reflection of a ghost in a mirror. Other times the poems here look off to a father’s rooftop in Saigon. Or they look deeply into the interiors of family, a brother’s silhouette in the doorway. The poem “Family Ties” asks, “What good does it do, this resemblance to nothing we know of the dollhouse” and later, in “An Empty House Is a Debt”: “There is a house in me. It is empty. I empty it. / Negative space: the only native emptiness there is.” These poems mean to make a song of emptiness, the spaces we house. The poet begins one passage with “framing, an act of enclosing, of closing off yourself from your environment and all the unintended sounds” and concludes this passage with “we fill in what bewilders us to fill what.” Thus the fragments and cutouts fill the void with music. The parts cut from the narrative become song while the remaining narrative becomes fragmented, half-remembered. The story told here reads like a kind of dream memoir. This is underscored in the series of altered photographs of the sort one might find in a family album. The images, like the poems, are intimate and unsettling; they are hazy specters of cultural and personal identity. This collection is steeped in the poetics of exile and elegy. In the title poem the poet writes, “Let me tell you a story about refugees. A mother and her dead son sit in the back seat of his car . . . Let me tell you a story about seat belts.” Lyric fills in the holes in the stories. These poems sing to and for the ghosts of identity, history and culture; they sing like a ghost who looks from the window or waits by the door. Ghost Of is unforgettable. 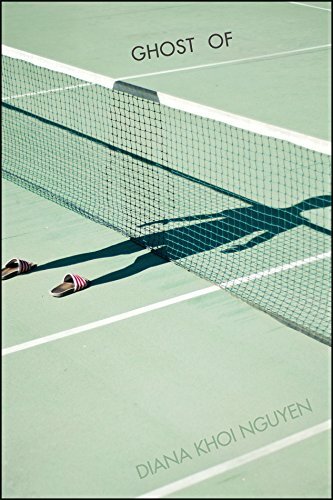 Diana Khoi Nguyen’s Ghost Of is nothing short of an extraordinary debut. At its center is the haunting disappearance of a brother, gone by suicide. These poems are uncanny renderings of an invisibility made visible by the sheer will of candor, bemused forms, agility of lexicon, and a voice, almost noiselessly extravagant. What she gives us, she takes away; nearly impossible transformations transform. “Something keeps not happening” she writes. And then she causes it to happen in a language of grief --bold and often colder than most daring, exquisite acts. Nothing here is ever entirely complete-- ghost of mourning, ghost of yearning, ghost of the kiln unfilled with the probable impossibility of an afterlife. It is as if a medieval scholar were transcribing an ancient Latin manuscript, pieces of script are missing, illegible, annulled by time. The scholar writes in the margins Desunt Non Nulla— signifying—Not No Things Are Missing, Nguyen’s voice is both wraithlike and astonishingly frontal; this is one of the most gifted first books I’ve read. Across these pages, sound makes shapes that, in turn, shape sounds, creating a complex weave in which absence figures as vividly as presence, and in which the absent are, in fact, present—in the faces so neatly cut out of the photographs . . . a haunting tribute to those we always carry with us, Nguyen's stunning first collection explores the layered losses of displacement, migration, and death in ways that take full responsibility for the particularity of each individual's experience. Written with equal parts frankness and compassion, the book radiates a very human generosity throughout. An astonishing scrapbook of lyric poems and photos where the central muse—her brother—is violently cut out. Poems are shaped into his silhouette as if Nguyen is trying to anatomize his tragic absence with pained and urgent remembrance. Nguyen writes with haunted precision and wondrous innovation. Ghost Of breaks my heart.